According to the Christmas folklore, Santa had a very special reindeer. Rudolf was his name and he was different from the other reindeers because he had a red nose. That nose allowed him to illuminate the night and guide Santa and the other reindeers during their trip around the world. But why a red light? Wouldn't it be easier to see through the night with a bright white light instead? Unless perhaps, the red nose would be a symbol for the Fly Agaric mushroom. 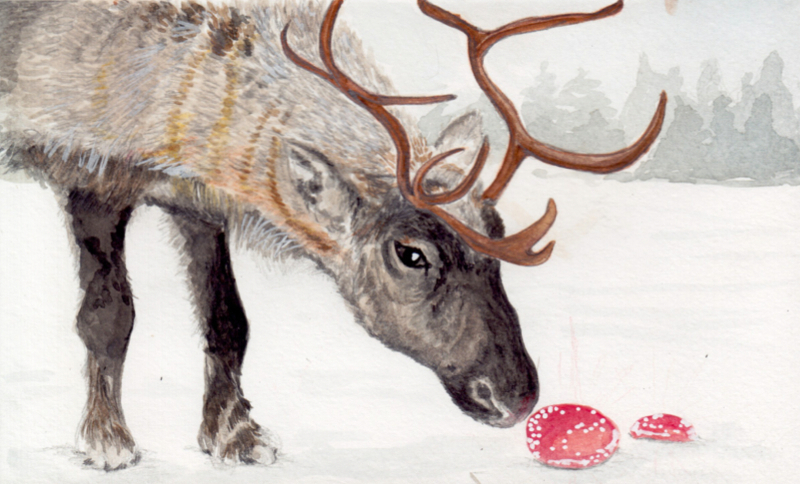 It just so happens that reindeers love to eat these mushrooms and are really good at finding them, sniffing the snow covered ground. Rudolf, the reindeer with the red nose would then be one who finds the mushroom. He would guide Santa (aka the Shaman) as well as the other reindeers on their mushroom trip, flying in the sky.